This makes me completely sick to my stomach. The driver should never be allowed behind the wheel again. She's also a liar. Some video for those of you with Facebook. If she couldn't see a group, what chance does a solo cyclist have? Not that I want this picture in my head, but how does a motorist actually hit that many cyclists during one incident? Were they all lined up on the fog line? Were they 3 abreast X2 rows? I'm not sure I could run over everyone in a group if I was trying on purpose. Makes little sense to me. Not many details in the report. "The driver told police that the sun was in her face and that she didn’t even see the cyclists"
Florida is a very sunny state. Adjust your driving habits accordingly. "She also told police she was distracted by something in the car." Time to subpoena her phone. Too many details missing, such as time of day, direction of travel... Just how exactly was the sun in her eyes? And what exactly "distracted" her in the car. Such total disregard for human life, and done so casually. I am sure the driver is a decent person who would never have intentionally even scared these riders ... but she had absolutely no awareness that she was in a two-ton battering ram, that the cyclists were protected by nothing but her good will, and her texts weren't going to evaporate if she didn't respond instantly. Total and casual disregard for the damage she could do ... and her phone was a priority over the lives of the cyclists. I agree, she should never be allowed to drive again. Felons who shoot people aren't allowed to have guns. Also .. . the video shows that the sun was to her right at the stretch of road where the accident happened. I think what happened is she was passing the cyclists while playing with her phone and drifted out of her lane. The cyclists were probably two abreast, but whatever ... buy the time the driver looked up she had hit the entire line ... at 88 feet per second, she could hit them all in about half a second, which would be about her reaction time. You appear to assuming facts not in evidence. What is it that you read that leads you to conclude "Such total disregard for human life, and done so casually"? As gruesome as this incident was/is, the driver remained at the scene and was cooperative with LE. It does not sound like she intentionally aimed her vehicle at the cyclists intending to kill or maim them. Sun her eyes, not on her phone according to the Sheriff. A terrible accident. 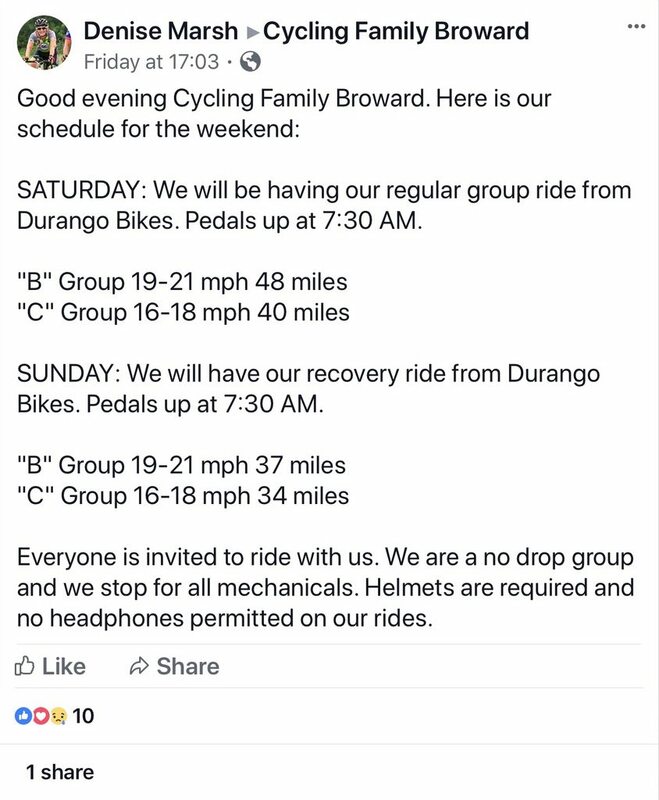 I feel awful for the bikers and their families, and for the driver. In the videos, the shadow lines of the people attending the victims run almost perfectly perpendicular to the direction of travel on the road. The sun was not in her eyes to any degree that it would keep an attentive motorist from seeing a large group of cyclists. She's a liar. The condition of her car essentially dictated that she had to remain on scene. I don't know what her intention was. I do know the result of her inattention was death and destruction. Completely avoidable. Like many or most accidents, yes...was probably avoidable and I'm sure the driver knows it. No doubt she'll pay a high price, both emotionally and legally. This is highly dependent on the time of day. The article says they were heading eastbound in the morning. Sunrise in Davie today was 0647, so it would've had to be pretty early. I have seen vehicles sustain massive damage and the driver kept on going eventually ditching the vehicle. Look, I am a cyclist, I ride on the roads, I worry about unattentive drivers. But until all the facts are in, and an investigation completed, we cannot state for certain what the cause or causes, of the accident was or were. RIP to the cyclist killed. May the other riders recover and heal quickly. The crash occurred about an hour and 40 minutes after sunrise. Next time you can see the sun, take note of the angle an hour and 40 minutes after sunrise. It's not such that an attentive driver can't see cyclists. Look at the videos taken immediately following the crash. Look at the shadow lines of the people. Hell, just look at it from the perspective of the driver doing the filming. The sun was NOT an issue. It was a lame excuse. This was NO ACCIDENT, it was a COLLISION with DEATH caused by a DISTRACTED driver that would have never happened if the driver were behaving within the law. The driver admitted she was distracted by something int he car. Further, the sun, while low, would be at the worst time if she were heading right into it ... but as the video shows, she was Not. In the video one of the police officers is performing CPR on a downed cyclist ... so the video wasn't taken a long time later or at a different site. The sun was NOT in her eyes. Furthermore ... if she was not able to see she was not able to drive. Unsafe operation, not driving to existing conditions ... look, we have all driven cars, and we know what it is like to have the sun or headlights in our eyes. Did any of us cause wrecks because of it? No ... we squinted, looked to the side a little, maybe slowed down a little, and drove safely. If she Really could not see enough drive .... she shouldn't have been driving. I do notice that every other car on the road with her, traveling in the same direction at the same time, did not hit the cyclists nor anyone else. Further still ... how far ahead could she Not see, that she hit some cyclists? Did they teleport in front of her?. Even if the sun obscured her vision for a second or two ... why did she leave her lane? How did she not know that there were cyclists there? Most likely, she was distracted by something in the car, as she said, and drifted right and hit the last two riders in the line. I say it is a casual disregard for human life because, unless the cyclists cut across her path ... she moved over and hit them. I do Not believe she hit anyone intentionally. I am sure she feels terrible. Then also, I am sure the families of the dead cyclist (not sure if the second has died) also feel pretty bad. My point is, she either didn't know the cyclists were there, in which case she had to be driving without paying attention for a long time .... or she knew the cyclists were there, and had no awareness of the fact that she was piloting a two-ton battering ram. She apparently did not take Extra care knowing she was passing cyclists. Some drivers, when passing me as I ride, give me Way more room than I need. I really appreciate this, because (as we all know from experience) sometimes the side of the road will present unexpected obstacles ... a stick, a sand-slide, some mud, a broken board like I saw last night .... cars that cut it close put the rider at risk. Drivers that give at less three feet put me at risk. Some drivers see cyclists as people on bikes. Some see them as obstacles to get past. The ones who just see obstacles .... are the ones who get "distracted" by non-life-threatening "distractions" and do things like this. I am sure this woman is a very nice lady who feels terrible. It is to her credit that she didn't try to run (assuming her car was able.) However ... she did something no different than going to into her backyard with a firearm and firing at random into a crowded suburb. She was in control of a deadly weapon and she wielded it casually and carelessly. At least one person died. I say, take away her driving rights for the rest of her life. Yes, it will hurt---that is the point. Make examples of people who drive carelessly, of people who abuse the right to use the road we all own and all have a right to use safely. The fact that she wasn't one of those lunatics who deliberately targeted cyclists does not make the people she hit any less crippled or killed. The fact is, whatever excuses she makes ... she rammed some cyclists. There is No Legal Justification or Excuse. I am sorry this lady did not take greater care while driving ... but that is what she did Not do, else she wouldn't have hit anyone. She obviously did not care enough about the potential damage she could do ... until after she did it. She treated driving too casually ... and at least one cyclist is dead therefore. Last edited by Maelochs; 11-26-18 at 05:29 AM. And yes, this is all my own opinion, based only on the facts in evidence ... the dead and severely injured cyclists and the statement attributed to the woman that she was distracted by something in her car. She drove her car in such a manner she collided with stuff. She was negligent in the responsibilities of her license. Plain & simple. That somebody died due to her actions means she is a murderer. ...but she is a driver. Though the proper charges are probably negligent homicide, I have my doubts she'll even be charged at all. I am at 26.90N 82.00W and the crash occurred at approximately 26.12N 80.30W. I am looking at the sun right now, 8:19AM and it is south of facing east as if I were riding on that road and the sun is not directly in my eyes, so can anybody do some computer magic and show an image on our screen as to where the sun would be if we were bicycling on the road at the crash scene/time. Bet the sun is not in our eyes. BTW, I agree with the word CRASH being used. That is my take on the matter ... even the same charge I think applies ... criminally negligent homicide. She had a clear understanding that her actions could lead to mayhem and death and acted with reckless disregard for others. Hopefully, she will not get "What a nice lady .. . she stopped and answered all the officer's questions ... let's let her off with a suspended fine for failure to use care and caution in passing" or some such. I bear this woman no malice. However .... she bore the person she killed no malice, and that person is dead. Vanderweit “was very cooperative,” where she talked with police and gave them permission to download potential crash data from the car as well as the contents of her cellphone. In 2014, she was cited for heading 45 mph in a 25 mph zone in Plantation, the records show. In 2012, a deputy cited her for going 85 mph in a 65 mph zone on Interstate 95 in Palm Beach County. There are knuckleheads out there folks. LOTS of them. Most drivers are distracted at one time or another. Choose your activities carefully. Also when, where, and how you perform those activities. Limit your exposure to those knuckleheads. You are in control of YOU and nobody else. Cycling into the rising/setting sun on just about any highway is always sketchy. "It won't happen to me" does not look good on a tombstone. “I pissed on dead people” doesn’t look good on a vault either. She didn’t ride into the sunrise.